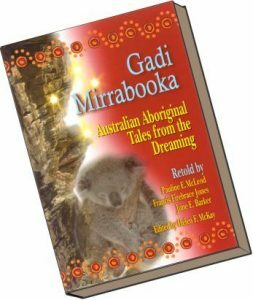 Aboriginal story book, Gadi Mirrabooka, with 33 dreamtime stories retold by Pauline McLeod, June Barker, and Francis Firebrace. Edited by Helen McKay with articles on mythology, culture, legends. Contains illustrations including above colour plates created by Francis Firebrace. Australian Aboriginal stories contain many life lessons useful in and out of school classrooms. Gadi Mirrabooka introduces wonderful tales from the Dreamtime, the mystical period of Australian Aboriginal beginning. Through these stories, learn about customs and values, animal psychology, hunting and gathering skills, cultural norms, moral behavior, the spiritual belief system, survival skills, and food resources.